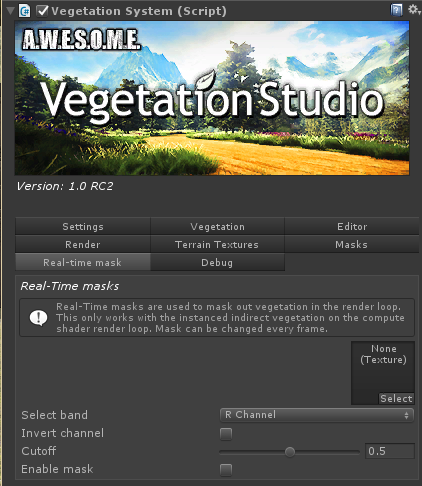 The real-time mask is a masking system that works with the compute shader render pipeline. You can add a mask texture with a 1:1 scale of the terrain and use this to mask out instanced indirect grass and plants. This happens every frame in the last compute shader pass and is updated instanced at close to 0 render cost. You can assign a texture2D or a rendertexture to the mask slot. Select the channel and cutoff you want for the result. This video shows a real-time mask produced by the lava flow system in microsplat. it is assigned and removes the grass real-time as lava flows.